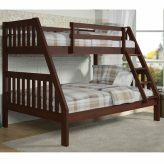 Wood bunk beds twin over full are sometimes referred to twin over double bunk beds. 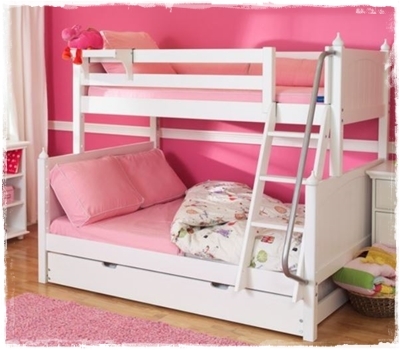 Great for siblings sharing a room or for those occasional overnight guests. To add a little more fun, consider a tent bunk bed or a bunk bed with slide. 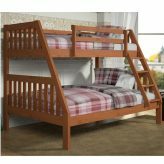 Twin over full bunk beds can come stacked with a twin over full mattress, L-shaped, or parallel. They sleep three easily. To optimize your room space even more or to add another sleeper, consider our twin over full bunk bed with trundle or under bed drawers. Perfect for small bedrooms that need to sleep more than one person. Wood bunk beds twin over full sleep overnight guests. 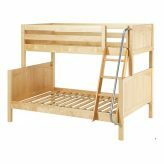 Solid wood bunk beds provide stability and rustic beauty. Whether you are looking for a white twin over full bunk bed, or a solid wood bunk be in one of many rich wood finishes – we have a bed for you. They will endure years of use and still look lovely. Fixed ladders and angled ladders are available as well as full length guardrails on the top bunk for optimum safety. 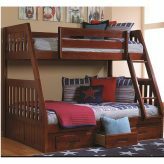 Choose roomy wood bunk beds twin over full for cozy bedtime stories.